home decoration over the last century. The legendary Parisian brand Hermès has been known for making super creative window displays and interior decoration for its stores around the world. Now they have opened a new installation, showcasing their everlasting fascination and constant improvement on materiality, color, craftsmanship and, above all, design. Curated in-house by artistic directors Charlotte Macaux Perelman and Alexis Fabry, the show takes place in the brand’s Dubai Mall store and impresses the public with its collection of items and its perfect exhibition design. 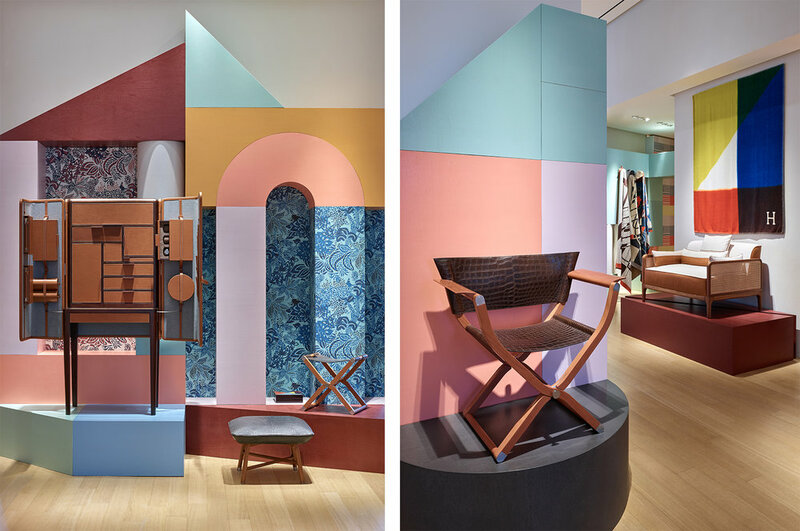 The installation stages Hermès’ furniture and home accessories against geometrical shapes and soft colors, smartly combined in different sizes and positions. Going through several techniques and material finishings like saddle, stitching and embroidery, the show pays homage to the impeccable craftsmanship applied on Hermès’ designs over time. Thus exemplifying how the brand is indeed committed to material and technical research, with the aim to always improve its final products. If you happen to be travelling to Dubai soon, don’t miss the chance to walk through this design dream of an exhibition and tell us what you liked most about it! If you enjoyed this article, you should check our story on Normann Copenhagen’s cinema in Copenhagen.